For the past 20 years cultural and historic ties between Saint Lucia and its closest Caribbean neighbor, Martinique, have been kept strong through the traditional sailing of the Gommier Canoe Crossing, The Bahamas Weekly reports. Held annually, the Gommier crossing has helped foster friendly relationships between the people of Martinique and Saint Lucia and more specifically, the twinning of two towns Gros Islet in Saint Lucia and Trois Islet in Martinique. The highly colorful rally also played a significant role in sustaining and maintaining the art of traditional boat building, especially in Martinique where indigenous techniques were quickly disappearing. Originally coordinated by friendly societies, today the event, which involves scores of participants, is coordinated by the Club des Gommiers De la Martinique. 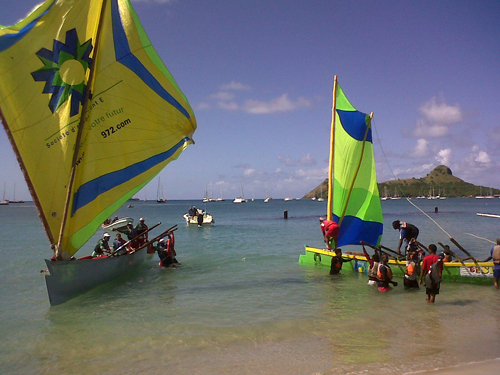 (Gommier Club of Martinique) The bulk of the canoes, called the Gommier, come from Saint Lucia. The boats are built by Saint Lucian builders and shipwrights from Martinique, and are then streamlined for racing. The Gros Islet Constituency Council and the Saint Lucia Tourist Board (SLTB) are coordinating the 2014 event, which is set to take place in the northern town of Gros Islet from March 14-16.Tourism Minister Hon. Lorne Theophilus, Commerce and Business Development Minister and Parliamentary Representative for Gros Islet, Hon. Emma Hippolyte and Gros Islet Mayor Clarence Rambally are among officials down to address the mariners as part of a pack program of activities to commemorate the Gommier Crossing.